The MORryde Easy Reel is a storage device that keeps your detachable power cord neatly stowed away when not in use. The manual hand crank quickly and easily draws your 30 or 50 amp power cord on to the reel. The Easy Reel utilizes an ingenious design to allow the end of your power cord to be held in place and the cord to be reeled in. 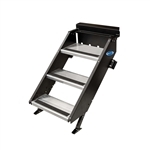 Rugged steel construction and high-quality powder coat finish. Simplest, smoothest, and most convenient way to store your power cord. The Easy Reel fits inside most storage areas. Stores the power cord in a 7-1/2 inch footprint. Can be mounted for either left hand or right-hand operation. Holds up to 50 ft of 50 Amp power cord. Installs easily with just 4 screws! MORryde CTG60-4290W Sliding Cargo Tray - 42" x 90" MORryde CTG60-3990W Sliding Cargo Tray - 39" x 90" MORryde CTG60-2048W Sliding Cargo Tray - 20" x 48" MORryde CTG60-2090W Sliding Cargo Tray - 20" x 90"
Marinco CS30-25RV ParkPower RVEEL Cordset, 30A 125V, 25' Marinco 6152SPPRV-25 Powercord Plus Cordset 50A 125/250V 25' MORryde UO21-003 X Factor Performance Cross Member - (SRE, CRE And Other Equalizers) Marinco 30RPCRV GripLock 30 Amp Right Angle Locking Cordset 30 ft.
MORryde CTG60-2960W Sliding Cargo Tray - 29" x 60" MORryde CTG60-4272W Sliding Cargo Tray - 42" x 72"